It’s been some time since actor Mamta Mohandas has been networking and aspiring for a break in Bollywood. However, she seems to be choosy when it comes to accepting roles. She demonstrated this trait when she reportedly refused a role opposite Shahid Kapoor. She was offered the role of Shahid’s young love in an untitled film being directed by Kunal Kohli. Regarding Mamta’s possible inhibition of sharing screen space with top league actress, Priyanka Chopra in the film, her friend answered, “No such worries, since Shahid will be seen in three roles and Priyanka is cast for one role. Mamta was supposed play the love interest of young Shahid and the role comes in at another time frame. Demure, Subdued, Quietened - as Ayaat, Mausam sees Sonam Kapoor anew. Contra to her spritely self the actress barely breaks into the slightest of smiles she lets silence and stillness speak volumes rather than peripheral trappings. Speaking exclusively to Filmicafe, Sonam shares with us why she loves Toronto, the biggest blessing of Mausam, matching steps with Shahid and fashion thoughts for her upcoming red carpet rendezvous. You’ve played the quintessential romantic heroine before, be it in Saawariya or I Hate Luv Storys. How is donning the romantic avatar with Ayaat in Mausam, a Sonam of difference? Sonam: Mausam’s Ayaat is extremely simple as compared to the other two characters I’ve played of Sakina in Saawariya and Simran in I Hate Luv Storys. She’s gone through a lot because of the riots in Kashmir, so there’s an innate stillness in her which has developed because she’s seen so much while growing up. She has her nightmares, her prayers, her hopes and desires. Harry comes into her life filling her with love, hope and energy which she tries to cling onto for the ten years journey she goes through with him. As Harry and Ayaat, you and Shahid are being warmly embraced and unanimously loved. What is it that makes your pairing spark and sparkle in Mausam’s decade long romance? 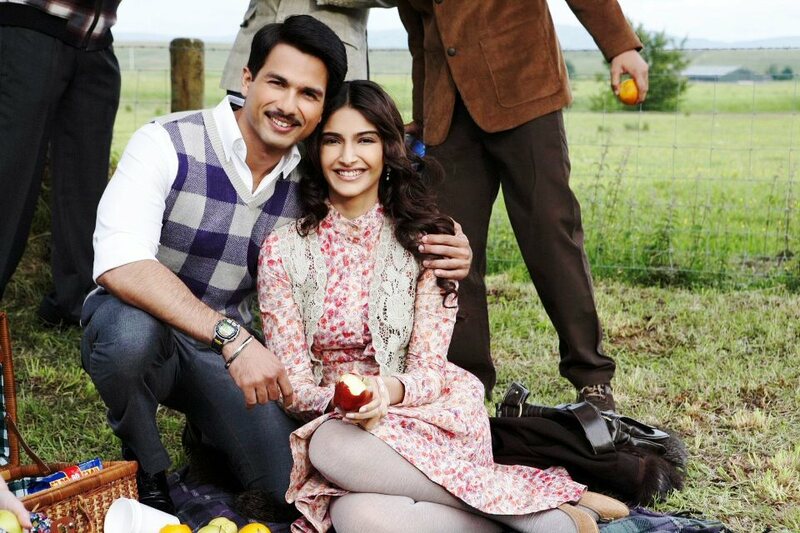 Sonam: It’s actually a 12 year progression for me in the film from 16 to 28 and for Shahid it’s from 18 to 30. Me and Shahid are opposites and there’s always chemistry when there are opposites. I honestly feel I’ve had chemistry with each and every hero of mine. Chemistry is all about acting and reacting to the person as well as what the director and writer write. If a scene is written which involves both the actors then chemistry is created - it’s all in the perception. I think Pankaj Sir has very smartly written scenes which create those moments and because Shahid and me get on quite well it translated nicely onscreen. Mausam has raised the bar for your ideal man you said recently. What would be those admirable and endearing characteristics of Harry? Sonam: I think Idealism, honesty and a purpose. People in the military, navy or air force all have an amazing sense of purpose - they know what their life’s mission is. Purpose is the most important thing in any person’s life. A sense of purpose gives great confidence to a human being because they know what defines them - that in itself is important and makes a man attractive. Shahid is one of the finest dancers in the industry and you’re waltzing with him in the film. How did you manage to keep up and match steps with him? 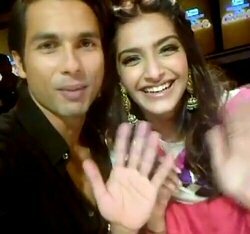 Sonam: In a waltz the man usually leads the woman, so Shahid had to do all the work (laughs) - jokes aside, the Viennese waltz we did is actually one of the toughest two people/partnered dance forms. At first we thought it’d be easy because it seems really easy just looking at a bunch of people going round and round (laughs) but it turned out to be a lot tougher. After rehearsing a whole lot and we eventually started enjoying ourselves. The music for a waltz is quite slow so in between shots Shahid would put on his hip-hop and start grooving to it. I like that kind of stuff - so waltzing was quite fun, romantic and beautiful. You’ve invested and committed a lot of yourself to Mausam. How taxing or rewarding has the experience been for and What’s been the biggest gift of Mausam? Sonam: This is actually one of my shorter films. Saawariya took two and half years to make and Delhi 6 took a year and nine months. Mausam has only taken a year and a half of my time so this is one of my less taxing films. It’s been extremely rewarding working on Mausam because I got to learn so much. Especially because Pankaj Sir is such a brilliant actor so I learn a lot from him. I learned a lot from Shahid as well, he’s been in this industry for so long - he knows the ins and outs way more than I do. On Mausam, I was working with the best in the industry whether it was the cinematographer, the art director, the makeup artist - they were all the best. It’s always great to be on a learning ground like that. The film will have its world premiere right here in Toronto. How are you feeling about returning to the big city with a small town feel? Sonam: You know how much I love Toronto - I really really love the city. I couldn’t unfortunately come for IIFA because I was working but I’m so excited and am looking forward to coming back, I can’t wait. I’m just coming for three days but I’m like but I need to go here, I need to go there (laughs). I’ve been in Toronto before for a month shooting Thank You so I’ve been everywhere - all the restaurants, the sea-facing eateries and all - the food is good, the shopping is good. I’m actually sort of upset that can’t visit properly and to do as much this time around. You’ve quickly become a click n’ carpet favourite - Cannes earlier this as L’Oreal Brand Ambassador and now the Toronto Film Festival in a couple of weeks. What’s coming out of your fashionable closet for Toronto? Sonam: I have no idea you know, I’m looking at something that’s really classic and really beautiful. I think I’m going to go again for something archival - I wore an archival gown in Cannes as well. My sister Rhea is going to styling me again for it so let’s see - it’s going to be a surprise. Give us a little bit more of a hint than that Sonam. Sonam: In Cannes I did an Indian and a Western outfit, I’m thinking of doing the same thing in Toronto. I believe there’s a press interaction and the red carpet so I’m going to choose either or for each one of them but I’m not going to do both western - I’m 100 percent going to do one Indian for it. Shahid Kapur, who comes from a broken home, found the shooting ofMausamvery unusual. It gave him the chance to spend some time with father Pankaj Kapur. Mausam was special because it gave him a chance to bond with his dad Pankaj Kapur. Shahid lived with his mother and maternal grandparents from the age of three after the divorce of his parents. He found it difficult to spend time with his father who is a much respected actor in the film and theatre fraternity. So, while shooting for Pankaj's directorial debut,Mausam,he ensured that he spent maximum time with his dad. While the father-son duo enjoyed each other's company on the sets, both are struggling to come to terms with the harsh reality of having to separate after the shoot was over. Reportedly, it was only during the filming ofMausamthat Shahid realised he didn't know his father's mother tongue-Punjabi. Apparently, Shahid was so upset about not having any attachment to his father's roots that he hired a tutor to teach him the language. "Shahid has the tutor travelling with him in London. He is really taking an interest to perfect the accent of the language", a source said.